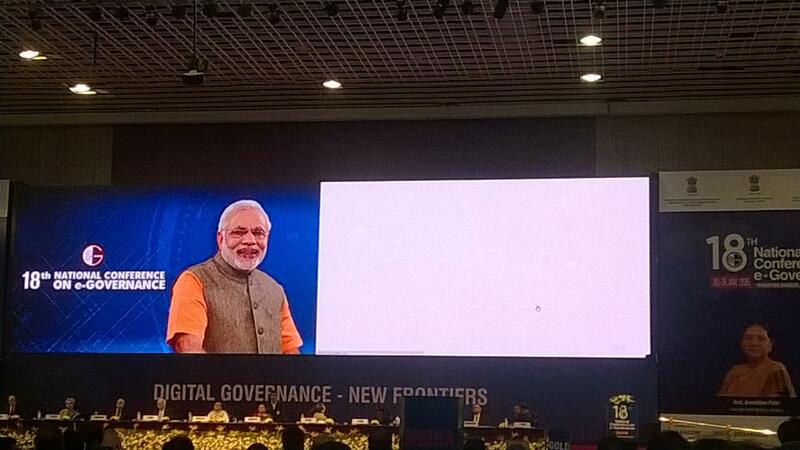 Prime Minister Narendra Modi today morning joined national conference on e-Governance in Gandhinagar through Twitter. This was for the first time the Prime Minister addressed any event through twitter. Good morning friends! I am delighted to join the 18th National Conference on e-Governance through Twitter. I wanted to personally attend the conference but was unable to do so. However, there was no way I could miss interacting with you. I thought- despite not attending, how can I connect with you. That is when I decided to use technology & talk to you via this medium. Am told this conference brings together several delegates from Central & State Govts, Armed Forces, Academia, Industry & private sector. The participants & their expertise make this conference a perfect forum to look at the way forward to effective & efficient e-Governance. I am also told that 22 awards will be presented in 12 categories. I congratulate all the award winners & laud their efforts. Am particularly delighted that the theme of this year’s conference revolves around digital governance, skill development & employability. Centre is committed to realising dream of a Digital India, with a vision to make India a digitally empowered society & knowledge economy. We are actively working to create a robust digital infrastructure that would serve the interests of our citizens & transform their lives. e-Governance is an essential part of our dream of Digital India. The more technology we infuse in Governance, the better it is for India. I am also certain that technology & e-Governance will make processes simpler & remove several obstacles slowing the pace of work & progress. While we look at e-Governance, let us think about ‘mobile first’ and thus give importance to m-Governance (mobile governance). I urge you to explore ways to provide as many services as possible through mobiles. Let us bring the world into our mobile phones! The youthful energy that our Nation possesses is our prized asset. Giving an impetus to skill development through technology is essential. Scale & speed at which we have to take India’s development journey requires maximum & smart utilisation of latest technology. I am sure this all-India conference will become a focal point of several innovative ideas that will help our Nation in the years to come. Once again, my best wishes to everyone in the conference. Thank you very much. Will leave for Rajghat & pay tributes to Mahatma Gandhi. 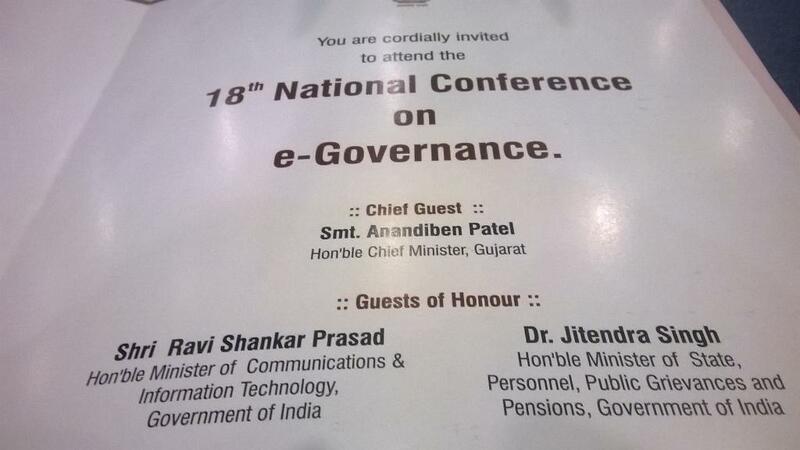 Interestingly while Shri Modi joined the conference through twitter, central ministers Ravishankar Prasad and Dr. Jitendra Singh gave a miss to 18th national conference on e-governance. Both of them were Guests of honor. Announcement on Dr. Jitendra Singh’s presence was made yesterday in media communication. Dr. Singh however seems occupied in his home-state Jammu & Kashmir affairs where BJP is soon going to form a government with PDP possibly with Dr. Singh himself as deputy chief minister.